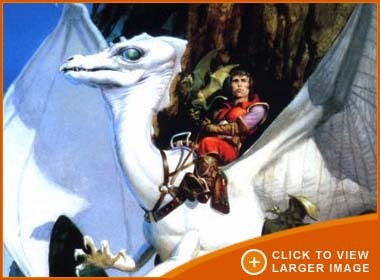 Pern was colonised by settlers from Earth who wanted to return to an agrarian society with a low level of technology. The name was originally an acronym: Parallels Earth Resources Negligible (i.e., insufficient to support interstellar commercial investment). Shortly after the first colony was established, the settlers were devastated to discover that their chosen planet was not a safe place. Pern is subject to periodic attack from space by the destructive Thread, a spaceborne spore that destroys orgainc substances on contact. Unable to retreat from the peril, the settlers developed methods of combating the Thread. "Holds" were dug into the cliffs for them to live in, and Pernese scientists "upgraded" a local reptilian lifeform, the fire-lizard, into full-sized flame-breathing telepathic dragons, who were able to sear the Thread before it could fall to the ground. Dragonriders became a vitally important and highly respected profession, living in Weyrs, and as time progressed, the settlers forgot their Terran origins. At the time of colonization, the eastern portion of the Southern Continent was selected as the most hospitable site to initiate the spread of civilization. Accordingly, Landing was established near the dormant volcano Mount Garben, on a fertile plateau near the Jordan River. Suitable stakeholds were established across much of the Southern Continent. The advent of Thread and the eruption of Mount Garben, both consequences of a close pass by the Red Star, forced the evacuation of first Landing, and then the entire Southern Continent, to Fort Hold on the Northern Continent. Circumstances then constrained human settlement for the next twenty-five centuries to the tectonically stable, cave-riddled Northern Continent. During the Ninth Pass of the Red Star, population pressure and improved technology made possible the recolonization of the Southern Continent and the rediscovery of the original settlements along with the creation of brand new ones such as the telescope protect on the oft forgotten Western Continent mentioned towards the end of 'The Skies of Pern'. 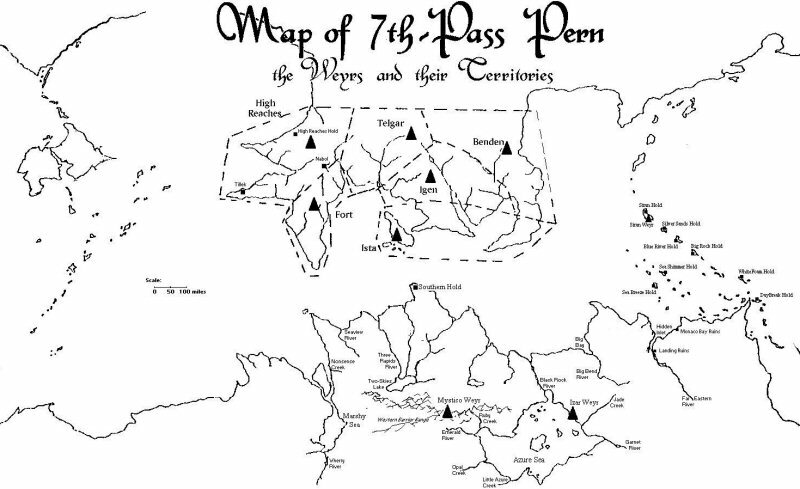 Pern bears three continents, four major oceans, and a large number of islands. The largest continent, the Southern, is noted for large areas of grassland and jungle, as well as high tectonic and volcanic activity (probably due to the two moons, although this increases with the coming of the Red Star). The Northern Continent, in contrast, is relatively infertile composed primarily of 'shield' bedrock and is the most tectonically stable landmass on the planet. Not much is known of the small Far Western Continent, as it has never been explored; its existence is known only from orbital satellite surveys and maritime expeditions. Pern is noted for its high incidence of cave systems, particularly in the Northern Continent. This feature heavily influenced the development of human society on the planet, as humans forced to take shelter in these caves eventually developed an intricate culture associated with cave-dwelling in a feudal society at a medieval - Renaissance level of technology. Pern is relatively lacking in most major metals. Nonetheless, sufficient deposits of petroleum and metals exist to supply a high-technology agrarian society, though not a high-technology industrial one. Although Pern has four major oceans, the only ocean of major concern to most inhabitants of Pern is the Southern, which separates the Northern and Southern Continents. Few expeditions have explored the Western and Eastern Oceans to either side of the main continents, and the Ring Sea is known only from satellite observations. The Southern Ocean is noted for its volatile weather and strong currents, which present a challenge for mariners. At least one tropical cyclone has occurred in the ocean in the course of the books.